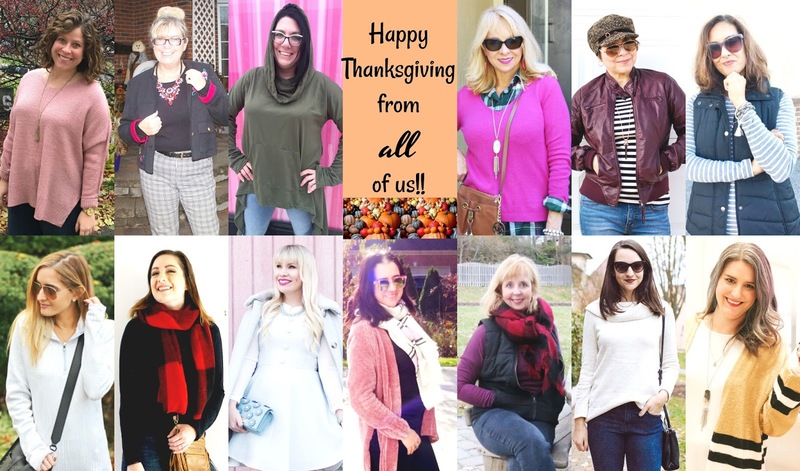 The Holiday Series: What to Wear on Black Friday, a Multi-Blogger Collaboration. Today I am back with 12 buddies of mine for part two of our Holiday Series we are doing this November and December. 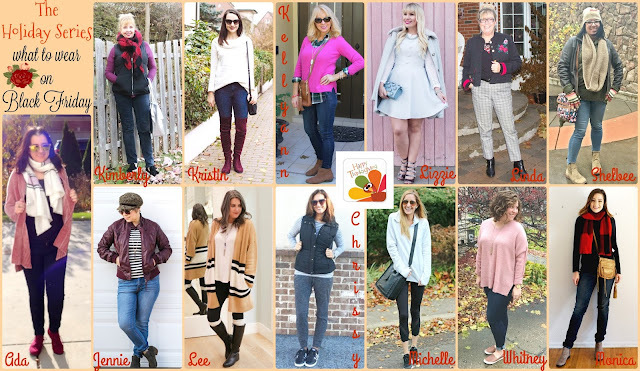 You can read part one - all about Cute Thanksgiving Outfits - here. 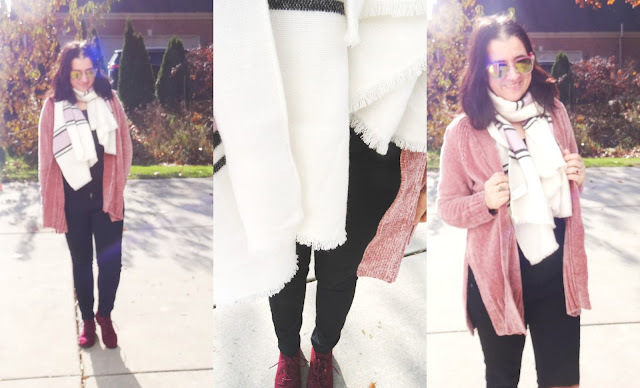 There is a lot of style inspo in that post, so if you don't know yet what to wear for Thanksgiving, you should read it and see many different ways to dress up, dress down (or in between, like I did) for turkey day. Today's post is all about what to wear on Black Friday. Not everyone will be shopping so our outfits are according to our plans but I couldn't help but see how similar a lot of our looks were. I am guessing jackets, puffer vests, sweaters and scarves are on everyone's Black Friday 'to wear list'. Here is all of us rocking layers and Fall colors this Black Friday. I noticed from our outfits that several of us wore either skinny jeans or leggings and comfy shoes like booties, OTK boots or sneakers. And look at all the burgundy and pink! I love all of these outfits the ladies are sharing but if I had to narrow it down to three favorites (in no particular) they would be: Linda's, Monica's and Kristin's outfits. But I must say I am dying over Whitney's sweater, Jennie's newsboy cap and Lee's oversized cardigan! Today I am thankful of all of the bloggers who stop to read and comment weekly and in particular of these blogging buddies whom I have the pleasure to collaborate with during "The Holiday Series". Last time I went shopping for Black Friday was in 2010. With the exception of the last two years when I lived in USA, the other years between 2010 and now I was living in Europe where we have no Thanksgiving. Black Friday is not what it used to be anymore. Last weekend I was at the mall and so any stores had Black Friday sales, some of them started this Monday and others are Thursday+Friday. I think it is silly that so many stores open between 4.00 and 6.00 PM now. It takes away from the joy of Thanksgiving and time we should spend with our families. What happened to those 10 o'clock or midnight sales?! Anyhow, I won't be shopping this Black Friday though I may do some shopping online on Thursday. Instead I will be working and volunteering with my co-workers (read more below on my Black Friday plans). I chose this outfit to wear that day since it is my Fall uniform after all and it is cozy, chic, put-together, comfortable and warm. I will be driving a lot and will be both indoor and outdoors a lot so I will be carrying a big puffer coat in my car, too. 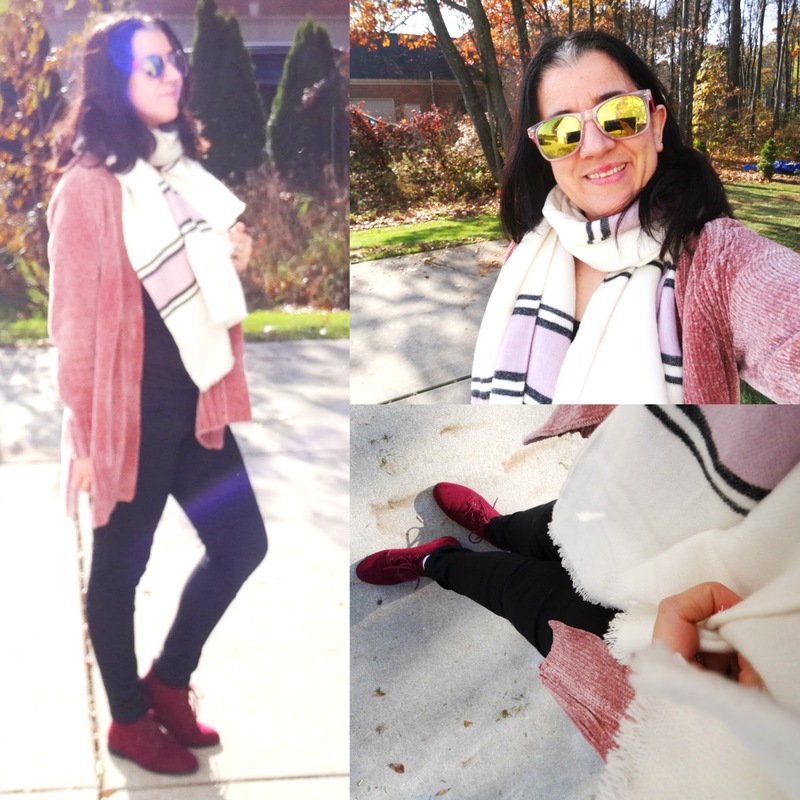 I wore a version of this outfit minus the scarf during the Common Challenge (you recognize my gorgeous pink chenille cardigan very well, by now). But it has gotten colder and this oversized wool-blend scarf is needed. I love how monochromatic this outfit feels even-though I have on 5 colors. It is mostly in black and pink that's why. Also my dessert booties or flat oxford booties have been receiving a ton of compliments lately. Mine are from last year but Forever 21 has some identical ones in burgundy that I have linked, for a steal! The identical cardigan and jeans - which are awesome - are also linked. The absolution jeans are by Nordstrom (from the #NSale), the softest chenille cardigan is from Loft and that oh-so-cozy and oh-so-pretty scarf is from Old Navy. Oh and this outfit by the way would be perfect to go to the stores and the malls too plus a crossbody bag because it is easy to layer or unlayer and try on clothes if you have to. But let's take the outfit away for a bit, I must say I am glad that I will be working and volunteering on one of the busiest shopping days of the year in US. Black Friday has always been associated with shopping, buying, spending money, trying to beat the crowds, etc. Even more so the last 4-5 years. Now stores open as early as 2.00 PM on Thursday which means those employees don't get to celebrate and relax with their families on Thanksgiving and won't even be eating Thanksgiving dinner for that matter. I am glad that there are many organizations or events like "Simply Give" that focus on other much more important things like giving, helping out and landing a hand to those that need it more, to the ones without a home or shelter, to the ones who can't afford a warm turkey dinner or can't afford gas or electricity to cook their meal with. This year on Black Friday, I will be away from the sales, the crowds and the shopping and get involved with charities to help many under-privileged families in the Metropolitan Detroit area. I am so happy to take the commercialism away from Black Friday, even for a tiny bit and focus on giving. So instead of shopping and spending money most of us shouldn't anyway, let's do something good for someone else. Let's stay away from buying things we don't need and let's help those who need us, instead! Here is what everyone will be doing on Black Friday. Read on to find out! Whitney: "As much as I love shopping, I am not a Black Friday shopper. I prefer to sleep-in, eat Thanksgiving leftovers and avoid the major crowds. I still love holiday shopping expeditions, though! It's fun to look festive but comfort is really key for a day of walking around and carrying shopping bags!" Linda: "In Canada we are still going full out on Black Friday but I do like dressing a little festive knowing that you are enjoying a special Holiday. Wearing my new embroidered blazer from Target with a pair of plaid pants I have owned for a few years. I will not be hitting the sales on Black Friday but I will be thinking of all my American Friends enjoying this time with their families." Shelbee: "For Black Friday shopping at the mall, I must be warm and comfortable for waiting in outside lines. But I also must wear enough layers to shed if I get too hot. I chose a lightweight hoodie, stretchy jeggings, and flat boots for lots of walking. I layered up with a leather jacket, hat, scarf, and gloves. Minimal jewelry to prevent snagging...just earrings and my wedding ring. Let's go shopping! " Kellyann: "This is an outfit I'd wear if I was actually going shopping on Black Friday. A crossbody bag is a necessity for me so my hands are free to shop! I want to be comfortable so I chose skinny jeans, a lightweight plaid shirt, and a v-neck sweater to keep me warm. Knowing my Florida climate as I do, the sweater will come off by noon! Right now I'm only planning on shopping online. I want to spend as much time as possible with my boys and soak up all that I have to be thankful for." Jennie: "I rarely actually go to any stores on Black Friday and stick to shopping on my laptop, but this year I may actually visit our local outlet mall and catch some sales. A lightweight jacket, hat, and boots will keep me warm and comfortable throughout the day without extra bulk." Chrissy: "Black Friday has always been a fun shopping adventure to me. I can recall standing in crazy lines for Bath and Body Works candles and Air Freshner plug-ins. However, for the last 3 years my Black Friday shopping is now on “Black Wednesday or Black Thursday” with my mother in law and sister in law in central Illinois. On official Black Friday you’ll find me traveling on the road back to GA with hubby and boys." Lee: "This year on Black Friday instead of running around spending money and buying things we don't need I am going to volunteer. I am apart of a local service league which holds an event called Christmas House which gives underprivileged children a new coat, 2 toys, and 2 new books for Christmas (or whatever holiday they celebrate). In order to have the items to offer we work with other companies to raise money or get donations. This year to get books we have partnered with Barnes and Noble (New Hope Commons Durham NC). As part of our partnership we will 'man' the gift wrapping table. So my black Friday will be spent wrapping gifts for shoppers at Barnes and Noble while spreading the word about Christmas House. 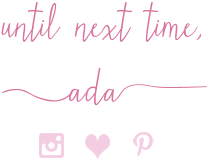 Head to my blog to learn more." Kristin: "Since I live in Germany, Black Friday isn't as big of an occasion as it is in the States. This year I'm going to be shopping online so I can still get in on all of the sales! I'm always looking for great deals on expensive winter items like boots, coats, and cashmere." Kimberly: "I would wear something comfortable and dress in layers so I can take things off if its crowded or the stores are hot. A lightweight/loose top, vest and scarf would complete my look." Ada: "This year on Black Friday I will be working and give or take I am going to be out and about for 12 hours straight so a comfy and warm outfit with black skinny jeans - still work-appropriate - a black long-sleeve wool tee and one of my long and cozy chenille cardigans will be what I will wear. I chose burgundy desert booties for comfort and a wool-blend blanket scarf to keep warm. My workplace is doing the "Simply Give" event this year on Black Friday. I will be doing a food-drive for families in need and after that a mittens+socks drive+deliver. Between all the driving and being in an out of my car, I wanted a layered look. I think my 'Fall Uniform' is also perfect for shopping on Black Friday since layers are a must. Lizzie: "On Black Friday, I like to wake up super early to take my siblings on a shopping spree in our PJ's. We have a lot of fun picking out presents for our family and making memories along the way." Monica: "Oh Black Friday, so many people get up so early to go shopping and I think it's become its own holiday as well. I like to be lazy Thanksgiving weekend and I'm not one of those people who wakes up early. I worked in retail for about 10 years, so I like to sleep in and take my time shopping. I usually can't find anything on Black Friday besides certain electronics. So my plans are to sleep in, and relax until I'm ready to shop." Michelle: "This outfit is totally ready for some Black Friday shopping. If you plan to shop online, then you will be cozy in this pullover and comfy leggings and if you plan to head out to stores, sneakers and a cross body bag are a must for a full day of shopping! Either way, go get those deals!" As you may notice there is a rose-gold tint to these photos today. I changed the setting on my camera and with the addition of the sun beaming over my head, I think these photos turned out cute and a little retro. This rose-gold undertone is perfect for this particular outfit with the soft pink cardigan. What are your Thanksgiving and Black Friday plans?! Will you be brave and face the crowds on Black Friday or shop at the comfort of your home, online?! Or better yet will you not shop at all and instead chill at home and eat some yummy leftovers?! Thanksgiving Day Outfits - this post. Our Holiday Home Tours are next and we are sharing those on December 7th which is the first Thursday of the last month of the year! That one will be my most favorite collab yet since I love Christmas and I loooove decorating for it!! Last, I am joining my friend Shelbee to co-host her Spread the Kindness Linkup today. Shelbee is a friend of mine for over a year now and she is one of the ladies that are collaborating today. 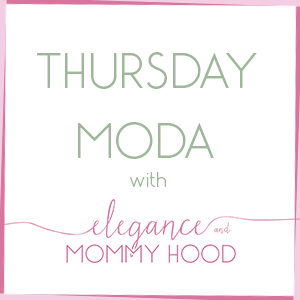 On Friday also, her and I re co-hosting her "On the Edge" linkup where we are styling Beautiful, Glam Holiday Dresses!